It's been just a month since my book, Estate of Horror has been published and we have almost reached the 100 mark of book units sold. Some of you have already read the book and are asking for a sequel! I am very flattered for your interest and appreciation of my writing. Let it be known we are working on the sequel and hope to have it out in the next 6 months. Some of you who have already read the book are interested in seeing some of the paranormal evidence we experienced. This week's blog will include some of the photos of the supernatural evidence that we cannot explain. These photos were taken at my deceased friend's house. 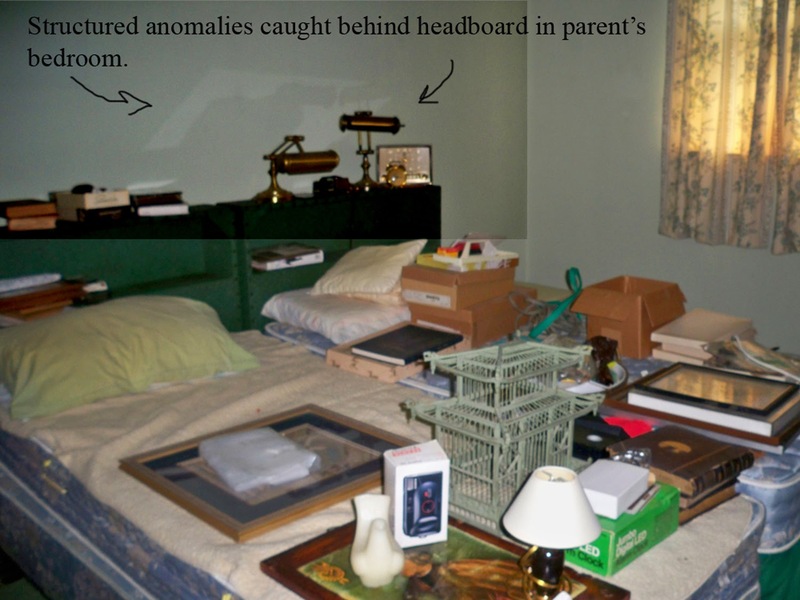 They are labeled to give reference to where and when they were taken in the house. They are in sequence and correlate to a particular chapter in the book so there is a point of reference. For those who have not read the book I hope you'll be intrigued enough to want to purchase a copy and join us on this journey of the unknown. I can hear the groans already in the paranormal community-not orbs?! I'm sorry but we mean no offense and know that this subject is very controversial. 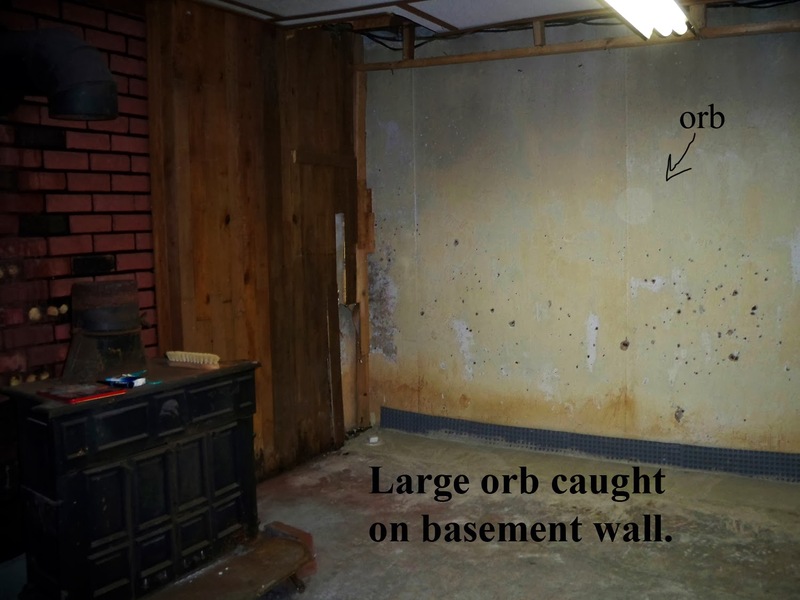 We honesty believe and have a strong conviction that these orbs/light anomalies at this location in my friend's bedroom are significant and of a paranormal/spectral nature. Five years ago I didn't know what an orb was, but I am well aware of how these artifacts can show up on a camera lens and I agree many can be explained as flares, dust and bugs, etc. (as I am a photo restoration artist and have been working with photos for 35 years I am able to discern this better than others). In June of 2009 we started to record and document all the paranormal activity that was happening in my friend Paul's house because it was becoming a daily issue with us. That particular day we set up a tape recorder and still camera in Paul's bedroom and a video camcorder in the basement. Here is what we caught in the bedroom. 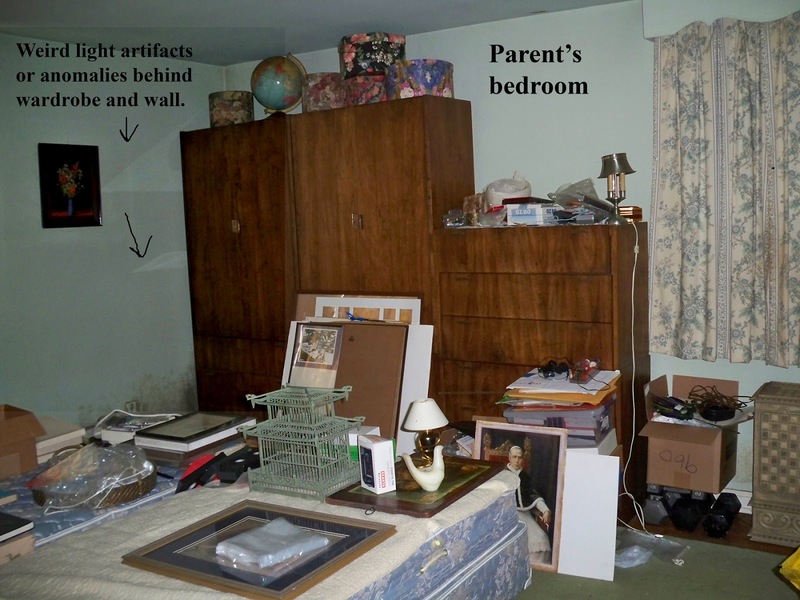 We also recorded audio of bangs and other unexplained noises coming from his room exactly at the same time we were having tremendous poltergeist activity below in the basement right under his bedroom. Later we discovered his covered typewriter there with these words typed on a sheet of paper still in the roller! We have no explanation for this but believe his room was a "hot spot" and a possible source of the haunting. This is a copy of the photo and shows enhancement of the orbs and light streak. This streak appears in other parts of the house at different times. This is a huge orb. 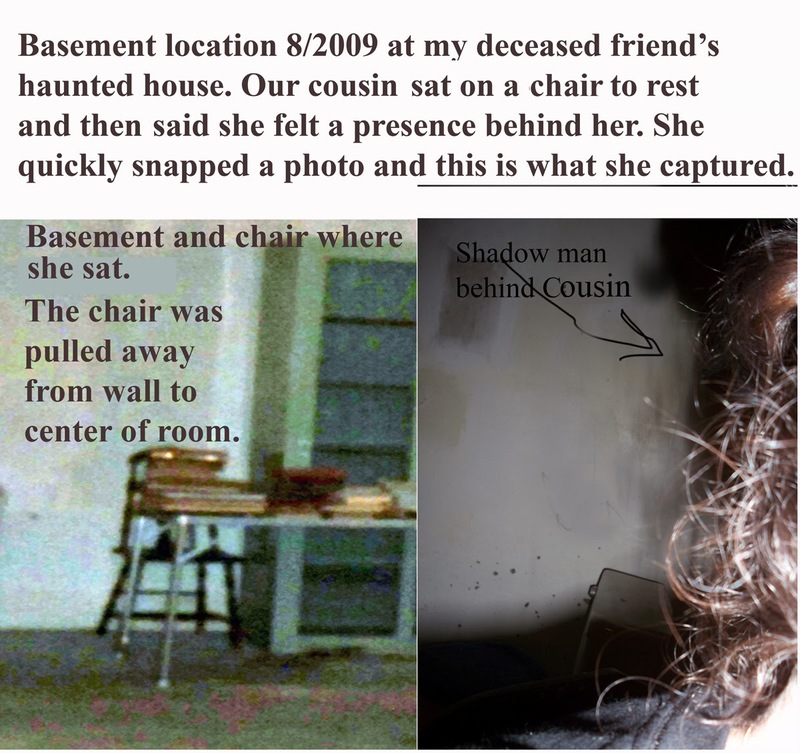 It showed up on my cousin's camera and was taken in August, 2009 several months after had construction done in that part of the basement for flood control. That is when the paranormal activity started. We had no idea at the time that we caught this. Much later my cousin showed it to us after reviewing her photos. My cousin did not use a flash and there is no other areas of dust or flying specks that show up anywhere else in her photos. In this chapter there was an extreme amount of poltergeist activity that we and my cousins experienced that day in the basement. They ran out of the house and said they would never come back! 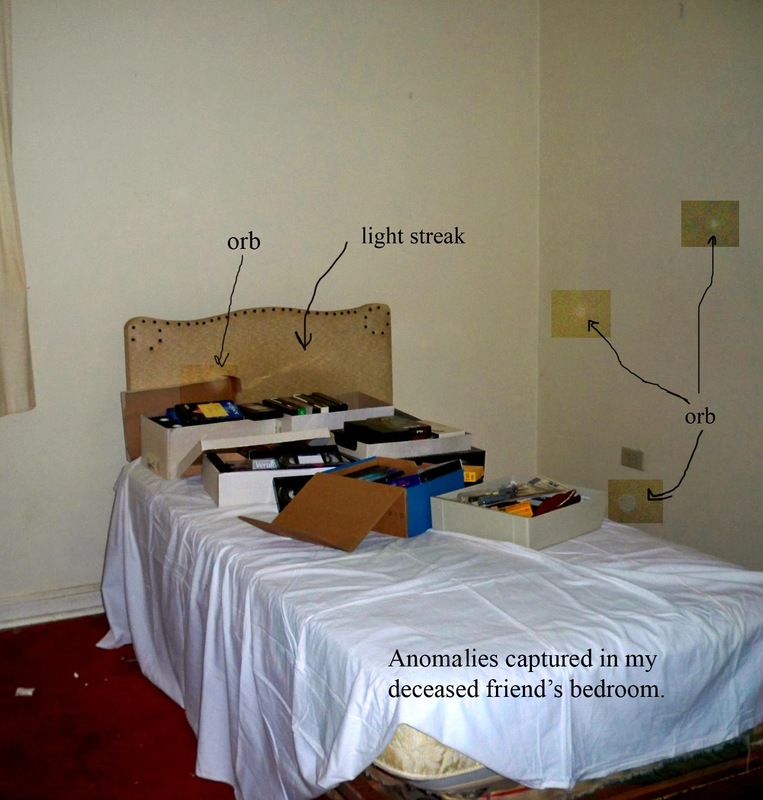 These photos were taken in August 2009 by my son Chris as he was investigating noises and tapping in this room. He was drawn by poltergeist activity that started that morning when were there to clean out the room. First a tissue box flew through the room and then one of the hat boxes on top of the wardrobe closet fell from a height of 8 feet of the shelf. When we first looked at the photos we dismissed them as reflections but then we took a second look and noticed how strange they looked. The room's windows had drawn curtains and the lighting wasn't great from overhead. The artifacts look angular like some type of weapon. A friend of ours, who was a B-24 pilot during WW 2, took at look and said that the objects looked like a flying vehicle and military in design. He said they were not reflections or shadows of the small lamps on the back headboard. That they were of themselves unique and not to related to any of the objects in the room. This is just the beginning of the evidence I will be sharing with you dear readers. As I said this is a journey we are still on for 5 years and it continues. We are currently writing the sequel to Estate of Horror and are documenting that evidence also. Finally, I hope there will be interested paranormal investigators and parapsychologists who will read my blog and my book (now up on Amazon & Kindle- for info: www.estateofhorror.com) and consider its merit as one of the most fascinating and terrifying stories of the supernatural they have ever read! This book is dedicated to all those who are not able or willing to write about their supernatural encounters and the heart break they have suffered in keeping silent. You are not crazy! THIS IS FOR YOU!